Just after WWII, the fashion for parallel-twins -started in 1937 by the Triumph Speed Twin designed by Edward Turner- had spread to all the British makers. Triumph had just won the TT with its sporty Tiger 100, and Norton- along with other British marques such as Ariel, AJS/ Matchless, Royal Enfield and BSA- built a machine with a similar specification, attempting to do as well (or better) by copying Triumph’s example. 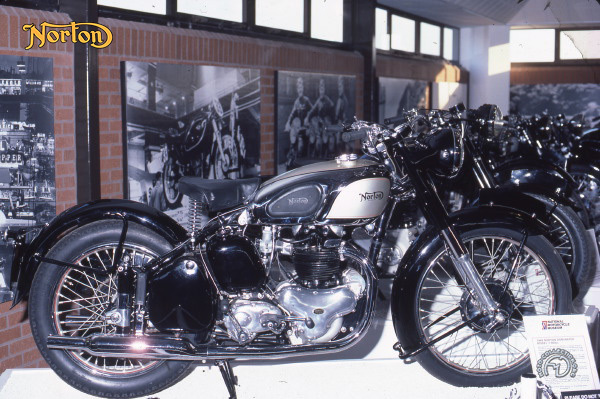 Norton entrusted the design of its twin to Bert Hopwood, who had worked at Triumph with Tumer. Because of the postwar restrictions on metal supply, the cylinder head of the Norton was in cast-iron rather than light-alloy like the Tiger 100, and Hopwood's main worry was to counteract overheating. Consequently, he used a very wide angle between the valves. Most of the twin's testing was carried out by a young rider named Geoff Duke, who later became one of the major stars of the post WWII period. The Model 7 Dominator was launched at the 1948 London Show. It was too heavy and did not have the acceleration expected of this type of engine, though it did possess a reasonable turn of speed. Joe Craig, who was then in charge of the Norton racing team and a bitter rival of Hopwood, was put in charge of its development, but the Triumph was still unbeatable. It was not until1951 that Norton - with an improved engine in a Featherbed frame- had a Dominator Deluxe that could really rival the Triumph. The Dominator Model 7 was Norton 's first twincylinder model since the Peugeot engined V-twin.